The small ferry pitches side to side as passengers unsteadily disembark, waves throwing turquoise sea water high onto rocky cliffs. The sun beams, but it's the last boat before an approaching storm and we're given stern instructions that we have exactly two hours to tour Oedo (pronounced way-doe), a small island in South Korea's 200 mile Hallyeohaesang National Maritime Park. Once just one of many uninhabited, barren islands along the country's craggy southern coastline, an industrious couple had a vision for this half-square-mile tiny land mass. Arriving penniless in the 1960's after the war, Mr. Lee Chang Ho (이 창 호) and his wife Choi Ho Suk (좨 호 숙) labored for 30 years, slowly transforming Oedo into a botanical splendor reminiscent of a Grecian isle. Visitors can explore Oedo unguided, at their own pace. We follow the crowd up a wide stone staircase that graduates onto a white concrete stone path. The incline is relatively steep and the slow pace gives us time to appreciate the diversity of green hues and the complexity of textures. Palm fronds intermingle with hollies, tall ferns, and the occasional orchid. A wall of tightly packed junipers towers high, separating into whimsical cone shapes. The salty air blows through a small group of thin bare trunks capped with mushroom-shaped evergreen arbors. 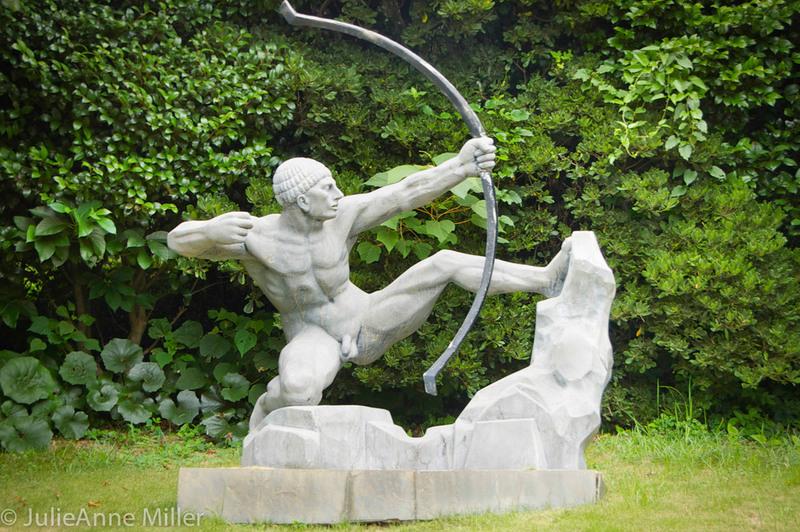 Here and there are statues: a naked archer pulls mightily on an invisible bow string and further ahead stands a weathered stone deer, unaware of his fate. We pass a row of regal palms and the trail opens up to the first of many themed garden spaces. 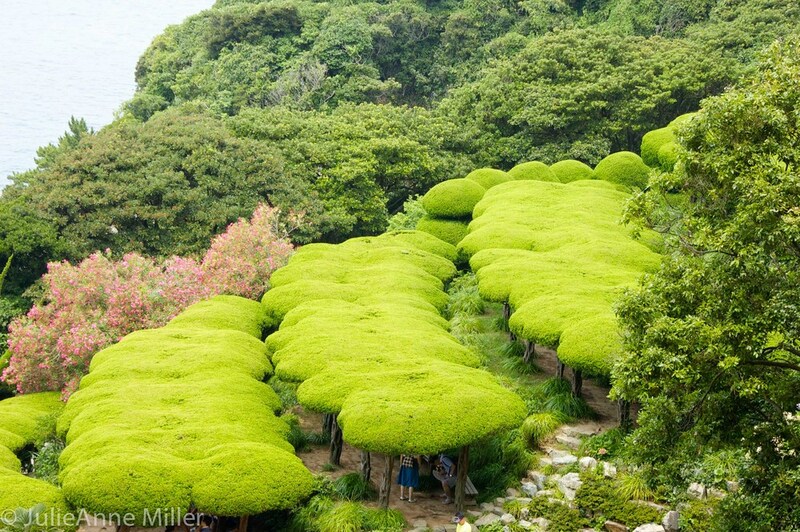 Bushes are meticulously pruned and shaped, with exquisite attention to detail. Not a branch strays from the care-takers design. A shady seating area has been arranged under a mass of rounded hedges. Our group of nine packs in among trailing ivy for a group photo. Higher now, a variety of flowering cacti of all shapes and sizes adorn this sunnier area, even as tropical trees and deciduous plants share the space. A giant aloe, camellias and agave are among the 3,000 plant species in Oedo. 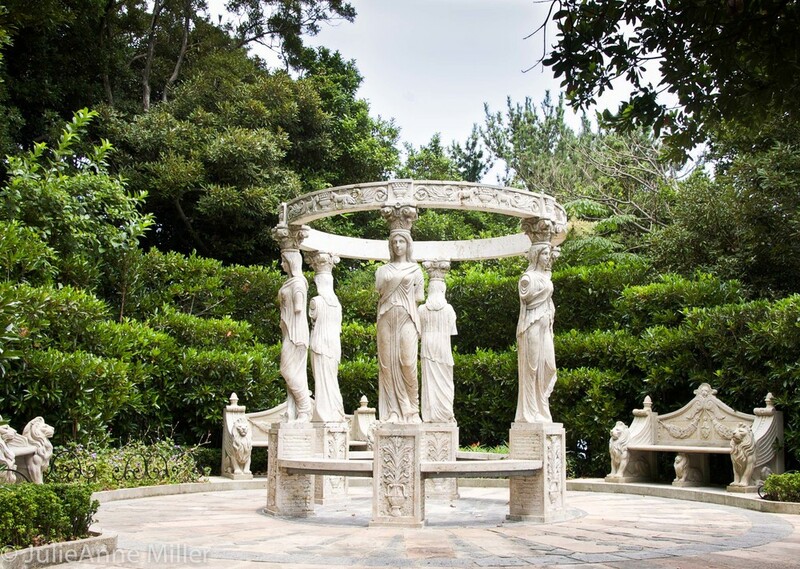 Then we encounter the main attraction, the European-style Venus Garden. On the far end sits the couple's Mediterranean villa. A circular walking path surrounds zig-zagging rows of neatly trimmed hedges and flowering bushes. On the opposite end, bright red roses encircle giant marble columns and a dozen greco-roman maidens adorn the terrace overlooking the stunning blue waters of the South Sea. 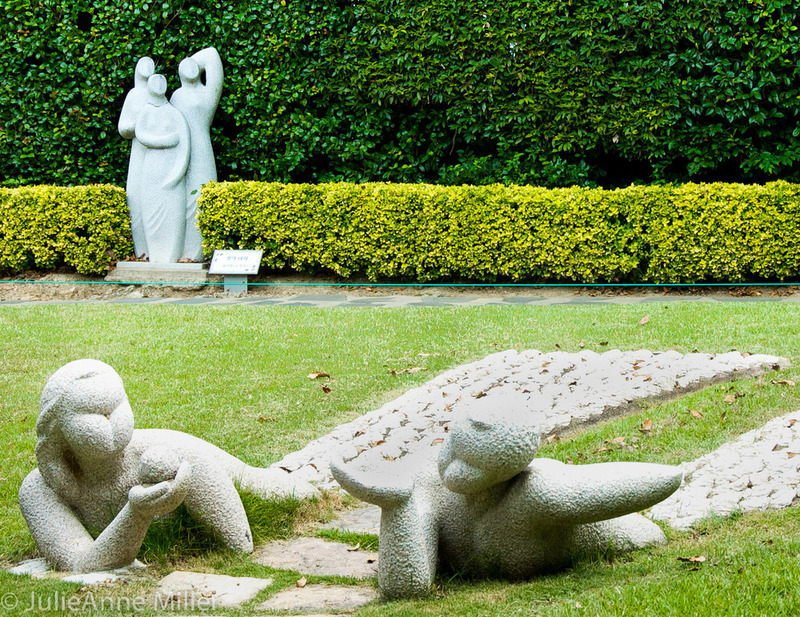 Venus Garden lies at the base of a spectacular hillside garden known as the Stairway to Heaven, with its terraces of colorful flowers and fanciful ornaments. Stiff pointed cypress and junipers stand in blankets of yellow, orange, and red. Giant bursts of pink azaleas and blue and purple hydrangeas surround artfully-shaped topiaries. As we explore, soft choir-style music serenades from hidden speakers. The trail ducks into a bamboo forest, obscuring the vista, and exits a few yards later into a wide open field with modern sculptures and statues made of clay, steel, wood, marble, and more. The silliest is a large grouping of little brown child-like figures in humorous poses. A tiny chapel draws visitors in for a thoughtful prayer. The trail passes through a gift and snack shop, then descends toward the port area down another terraced hillside with plenty of shade and picnic areas to enjoy a drink or snack. We listen to the waves crash into the seaside cliffs and feel the cool breeze picking up energy, then dutifully return to the dock on time for departure. Oedo is accessible by ferry from six different ports in Geoje Island. Admission fee to Oedo is about $8.00 per adult. A walking tour takes about 2 hours. The blog "Discovering Korea" has more logistical information and some great photos. If you like this post, let me know by clicking the heart at the bottom. Or consider sharing it on your social media channels. We would love to see photos of your trip to South Korea, so go ahead and connect with us on Instagram, Twitter, Pinterest, or Facebook, too!